Obviously, broccoli is healthy and is often on many list of superfoods. However, the broccoli that comes in a takeout container is usually sopped with sauce that is usually high in sodium, sugar, and fat. Hmm. That kind of defeats the purpose of eating broccoli, no? 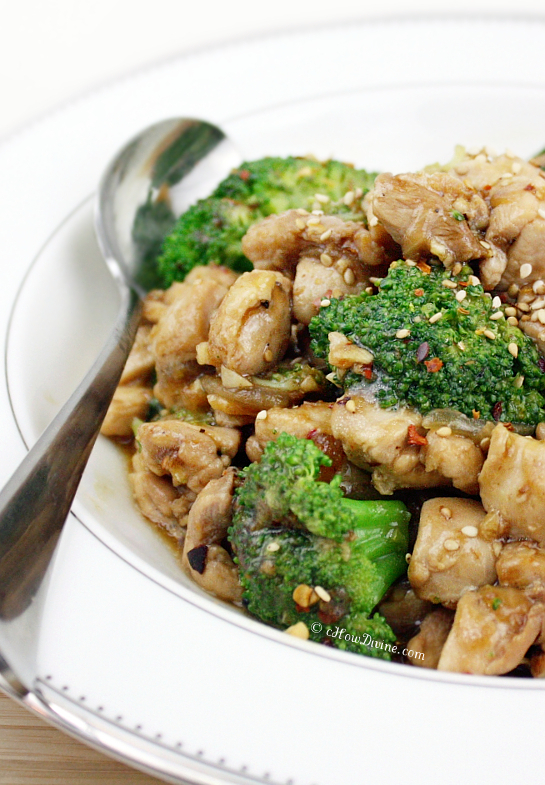 More troubling than the sauce-sopped broccoli is the chicken itself. I don’t know if you’ve heard, but overuse of antibiotics in chicken have been linked to drug-resistant bladder infections in humans. I highly doubt most restaurants use organic chicken (antibiotics cannot be used on organic chicken). So making this dish at home makes sense on all fronts. Believe it or not, it saves time. It’s a whole lot healthier and tastier. And I know where my ingredients come from and how the dish is prepared. I buy skinless and boneless organic chicken from my local market or Trader Joe’s. I cut them up into bite-sized pieces for the week on Sunday. And I buy organic broccoli florets. I know. It’s cheating. It’s costly. blah. blah. blah. But it saves so much time. And I end up throwing away the stalk if I buy a bunch anyway. I know you can eat the stalk; but I never do. With the florets, I just give it a good rinse under cold water. It’s ready to use in seconds. This dish should take way less than 30 minutes to cook. The broccoli should take no more than 3 minutes to steam. You want your broccoli to still taste like broccoli don’t you? And the stir-fry portion of the cooking should take no more than 5-7 minutes. You can do all of it in one skillet. Just make sure it has a lid. Simple and quick recipe. Easy cleanup. Delicious and healthy. Your whole family can enjoy the dish. If you have little kids, however, go easy on the red chili pepper flakes and forgo the sherry (just in case the alcohol doesn’t evaporate fully). Stir together tamari, oyster sauce, brown sugar or agave nectar, sherry, and balsamic vinegar. Set aside. 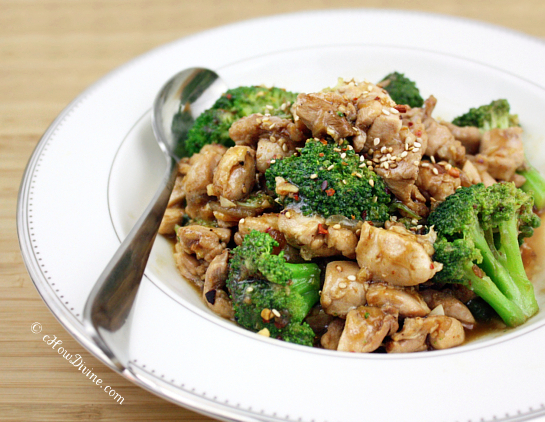 In a large skillet (big enough to fit the broccoli) with a lid, add broccoli and 1/2 cup of water. Cover tightly. Heat and let it come to a boil. Allow the broccoli to steam for about 2-3 minutes (no more!) until they become bright green. Drain and set aside. Rinse out the skillet. Heat the skillet over medium-high heat. Add enough oil to coat the pan. Once the pan becomes hot, add chicken and quickly sauté until almost cooked through. Add a small pinch of salt and pepper, minced garlic, ginger, and chili pepper flakes to the chicken and sauté for another minute until the mixture becomes fragrant. Add 2 TB of the sauce from step 1 to the chicken. Stir until the pan is ALMOST dry and the chicken has absorbed the sauce. Add rest of the sauce from step 1 and corn starch dissolved in chicken broth to the pan. As soon as the sauce starts to bubble/boil, add broccoli and stir. Allow the sauce to thicken, while stirring. This should happen very quickly, 1 minute tops. Remove from heat. Garnish with whole sesame seeds and additional chili pepper flakes if desired. 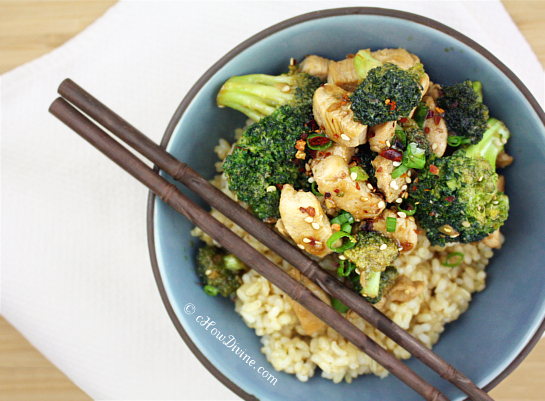 Serve immediately with some steamed rice. Cook’s Note: I cut my chicken into bite-sized 1/2-inch squares. I find that it absorbs flavors well when cut into smaller sizes. However, if you do decide to cut the chicken into larger sizes, make sure you make them uniform in size. You don’t want some overcooked, while others are still raw. If you do not have oyster sauce or are allergic to ingredients in the sauce, just replace it with more tamari. If you do make the substitution, add an additional teaspoon of cornstarch dissolved in a little bit of water and an additional 1/2 teaspoon of brown sugar or agave nectar. Lastly, if you have sucanat, you can use it in place of brown sugar or agave nectar. Oh I can see myself making this for my weekend date night with hubby when kids are at grandma:) This certainly looks and sounds very tasty, appealing, healthy and tempting! Will have to pin it! By the way great post and yummy pics! Thank you Sandra for your kind words! Let me know how it turns out! It’s so quick to prepare. I can usually get it on the table in about 15 minutes. It’s a great weekday meal! This was fabulous!!! My husband and three little girls happily gobbled it up. So much better than take out! Thank you so much for letting me know how it turned out, Aubrey! I’m so glad you and your family enjoyed the dish. We prefer this version to the takeout as well. 🙂 Have a lovely weekend! This is one of my favorite recipes! Everyone loved this, including my boyfriend who normally won’t eat broccoli. Thank you for the recipe! I forgot to mention that I used fish sauce cos I didn’t have oyster sauce. It was still delicious! I’m glad you mentioned fish sauce, because I do this sometimes too. I do it even when I have oyster sauce just for the change in flavor. But just in case others are thinking of using fish sauce, please be mindful that fish sauce has a sodium content THAT IS MORE THAN TWICE as high as oyster sauce. So dilute it with water if need be when making the substitution. You can always add salt later, but you can’t take it back! And you can add a little bit more corn starch and brown sugar/agave nectar if you make the substitution as stated in the Cook’s Notes section. Thank you again for sharing Nicole!!! Hi Bonnie ~ Thanks for letting me know! I’ll be sure to check your site tomorrow. I’m looking forward to seeing your post! Thank you for the recipe. Whole family enjoyed this dish. Thank you! My family and I also just had this dish. 🙂 It’s one of our favorites! Just found this recipe on Pinterest, and I’m thinking to try it soon. I also wonder if it would be good with shrimp or maybe tofu. Hi Molly, it’s delicious with shrimp. I’ve made this with shrimp numerous times for my family. With tofu, it will taste better if you pat the tofu dry, dust it with some corn starch, and pan-fry the pieces before sauce is added. Alternatively, you can freeze (then thaw and pat dry) the tofu before cooking. The reason for this is so that the tofu can absorb the sauce. This extra step is the primary reason why I don’t use tofu for this dish. :) Hope this helps!